Hi, I am interested in your 1997 Ford Mustang (stock #5109-CHA) listed on Autotrader for $17,995. I'd like to get more information about this vehicle and confirm its availability. This is the Cobra you want to get your hands on right now. 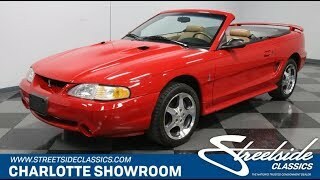 The 1997 Ford Mustang SVT Cobra is from the era of big power with the 4.6-liter V8, and they made more than double the number of coupes this year as convertibles. So its amazing this low mileage, loaded, and highly original package is available for such an obtainable price. The Cobra name should already make you weak in the knees, but take a moment to check out the whole package. After all, a red Mustang convertible is a true American icon. This is a modern American classic, which means the brightwork is only for accenting. So it really stands out in places like the COBRA name on the bumper and the polished 17-inch SVT wheels. What is SVT? Thats Fords Special Vehicle Team. They are the ones not only responsible for all the great design touches like the unique fascia, hood scoops, spoiler, and coiled snake badges, but they also engineered this convertible to have the performance to back up its sporty image. If you like the way the tan roof gives this a timelessly sophisticated look, then youll love the tan leather interior. The Cobra got every comfort and convenience option in the Mustang catalog. So the driver gets a great performance package that includes white-faced analog gauges, a leather-wrapped wheel, and a contouring bucket seat that power adjusts to the ideal driving position. Plus, power locks, keyless entry, cruise control, and the premium factory AM/FM/CD/cassette stereo will keep everyone happy. This modern classic also lets you take advantage of safety features like dual airbags and anti-lock brakes. Best of all, the power windows and power convertible top mean you never have to leave the drivers seat to go from enclosed comfort to a wind-in-your-hair experience. And the cold-blowing air conditioning keeps you comfortable even with the top down in the summertime. With such low mileage, it should be no surprise that its believed this has the original performance-bred V8 under the hood. The DOHC 4.6-liter motor has the kind of versatile powerband that made this car an instant classic. The 32-valve setup gives this a terrific bottom-end, and the V8 grunt makes it feel like it could pull forever. Theres a huge aftermarket supply, but this highly original package has been preserved to be fresh, clean, and a well-maintained representation of the finest from Ford. The five-speed manual transmission snaps through the gears easily, and the factory upgraded the chassis to make it worthy of the Cobra name. Helping corral all this performance is the power steering, massive four-wheel disc brakes, and grippy BF Goodrich performance tires. Complete with owners manual and tonneau cover for the back seats, its amazing you can get such a powerful convertible for such an affordable price. Call now!